The Odyssey drops out of hyperspace inside the Pegasus Galaxy. In the mess hall, Colonel Cameron Mitchell and Vala Mal Doran sit opposite a sleeping Dr. Daniel Jackson. Mitchell tickles Jackson’s ear, rousing him, just as Colonel Emerson announces their approach to Atlantis. They race to the bridge. Samantha Carter is already there. Mitchell suggests they take a moment to enjoy the view. When it’s over, Carter, Vala and Mitchell head off as Jackson takes in Atlantis a bit longer. In the city, Carter conducts a mission briefing with Dr. Elizabeth Weir, Mitchell, Jackson, Vala, Dr. Rodney McKay and Colonel John Sheppard. The Ori Supergate has been inactive since the first ships came through. Priors are promising reinforcements. Carter plans to use a gate Teal’c is positioning near the Supergate to dial in with one powered by a Pegasus Galaxy black hole. A directed nuclear blast will force a jump to the Supergate, preventing the Ori from using it. Jackson and Vala are staying behind in order to search the Ancient database for clues to Merlin’s weapon, the Sangraal. Sheppard tells Mitchell that McKay is mortally allergic to citrus as he tosses him a lemon. Vala, contemplating the “souvenirs” the city must harbor, wants to sight-see, but Jackson steers her back to their part of the mission. She lifts an electronic device from Dr. Zelenka’s desk, which he hurries after her to retrieve. Carter and McKay secure the warheads on Odyssey. Rodney takes a moment to tell Carter how she saved him when he was in a tight situation (“Grace Under Pressure”). She isn’t flattered, especially when he reveals she was half-naked. With the V.R. room’s holographic interface — an image of a Lantean woman — Jackson begins his research. Bored, Vala goads him into simply asking where Castiana and Sahal are, even though Weir has said her search of the database revealed nothing. The hologram immediately discloses their Milky Way locations and gate addresses. Near a black hole accretion disk, Odyssey releases a Milky Way Stargate. Inside the Milky Way, Teal’c has positioned a regular Stargate near the Supergate. 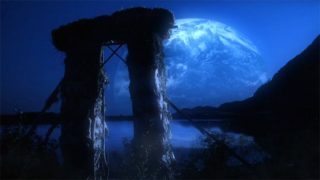 Carter releases a directed nuclear charge near the Stargate, which translates much of the explosion through the other side, but Teal’c reports it is inadequate. No jump has been made. Question answered, Vala is ready to leave, but Jackson is suspicious. He asks to see a visual record of Atlanteans who fled to Earth after the first siege. They spot Moros, whom they recognize as Merlin. Faced with Vala’s impatience, Jackson finally confronts the hologram. The hologram turns and looks him in the eye. “You have your answer, Daniel Jackson,” she says. “I suggest you act on it.” She disappears. McKay and Carter argue about calculations for the next try. Mitchell prods McKay, forcing him to work harder by threatening him with the lemon. Eventually, McKay explains that they need a different sort of blast — two bombs, exploding in succession. Emerson is concerned about Odyssey and the Stargate, but Carter feels it’s worth the risk. Zelenka informs Weir that because of the blasts a Wraith hive ship has been drawn to Odyssey‘s location. Because of the black hole, communications and sensors will not function. Weir calls the S.G.C. Sergeant Harriman agrees to have Teal’c pass the warning through his Stargate. Jackson tells Vala and Weir that the hologram was Morgan Le Fay, an ascended Ancient. Coaxed back, Morgan explains that she and Merlin ascended, but several thousand years later, Merlin retook human form when he saw the threat of the Ori. He kept his work secret, but Morgan was sent to observe. By retaining all of his ascended knowledge and powers, Merlin created a weapon that could wipe out all ascended beings. He also formed an enclave of man — Arthur and Camelot — to whom he entrusted with his secret. Long ago his opponent, Morgan now understands. Carter beams in the warheads. Teal’c reports they were unsuccessful, although energy did pass between the gates this time. Before a final attempt can be prepared, an Ori ship arrives at the Supergate. Teal’c conceals their Stargate by extending the cargo ship’s cloaking field. Morgan claims to have no reason to deceive them. She used her teaching hologram as a means of communicating the answers they sought, without overstepping the rules. Jackson rails against hidden clues and cryptic messages. The Ori are a threat to all humans as well as the ascended. When the war is over and all humans feed Ori the power they seek, they will come for the Ancients. Everyone’s survival is on the line. As the Ori ship patrols the Supergate, SG-11 relays Weir’s warning. In Pegasus, the Wraith vessel emerges from hyperspace. Teal’c passes along the message. Jackson surmises that Morgan is afraid of doing the right thing and being punished. He encourages her to be a leader and cross the line the Ancients have established. Vala asks her which planet to search. As Morgan begins her reply, she is pulled away by the others of her kind. The Wraith fire, knocking out Odyssey‘s hyperdrive. As the hive ship slingshots around the black hole their jamming technology fails. Carter beams the warheads into the ship. Odyssey slingshots around the anomaly as well, using the gravity well to accelerate out. Just as the hive ship comes into range of the Stargate, Carter detonates the warheads. Teal’c powers his systems, luring the Ori ship over the Supergate. The energy boost from the Wraith ship’s destruction makes the gate jump work. The energy vortex of the activating Supergate destroys the Ori ship — a great and unexpected victory. While looking out over Atlantis, Vala consoles Jackson. They now have the addresses to the worlds they needed to find. But one sad truth has been revealed. The Ancients are not going to help. “The Pegasus Project” is the first major crossover between Stargate SG-1 and Stargate Atlantis, with the majority of cast members from both shows appearing. Only Atlantis‘s Jason Momoa (“Ronon Dex”), Rachel Luttrell (“Teyla Emmagan”), and Paul McGillion (“Carson Beckett”) do not appear. Only Torri Higginson (“Elizabeth Weir” — “New Order”) and David Hewlett (“Rodney McKay” — “48 Hours,” “Redemption,” “Moebius”) have previously appeared on Stargate SG-1. “He was going to put Daniel in an Atlantis episode and decided that it’s much better for our arc to find this lost city of the Ancients to tie into the SG-1 story arc, because it was such a huge part of the mythology of SG-1 for years. So, basically, what ends up happening is we are looking for a way to cut our losses, so to speak, with what happened at the end of the cliffhanger — to sort of circle the wagons on one half of storyline. And the other half of the storyline involves Daniel and Vala spending a considerable amount of time digging through the archives of the Atlantis library. And an interesting and titillating discovery is made at that place which I think will surprise the audience. “A crossover fan favorite that I constantly get confused with ‘Beachhead,’ another crossover fan favorite. This was the episode in which Mitchell threatens McKay with a lemon — an ad-lib on the day that seemed altogether weird in dailies but, ultimately, ended up making the final cut. McKay’s citrus allergy was apparently inspired by a staff writer in the show’s early days (before my time anyway) who would always make it a point to proclaim his unique hypersensitivity to anyone who would listen. Whenever they’d go out for lunch, said writer would be very careful to clear all menu items with the server. ‘I’m very allergic to citrus,’ he would inform them. ‘A single drop and I could die!’ It wasn’t until the end of the season that they discovered the rib sauce their afflicted co-worker had so enjoyed on his bi-weekly lunches at a local rotisserie joint was, in fact, mostly molasses and lemon juice. And Rodney McKay’s citrus allergy was born. “Daniel finally makes it to Atlantis. I remember watching the Atlantis pilot and really wishing that he had been there when they first discovered the city. When Daniel arrives at Atlantis in ‘The Pegasus Project’ it’s one of those revelation moments for my character that I enjoy having with him. I mean, he’s all about exploration and here’s the biggest discovery he’s ever had and it was neat to do that scene with Daniel standing on the observation deck and looking out at the city. He spent seven years searching for this damn place and now he’s finally here with this awesome view in front of him. It was a joy to play that. “As far as filming this episode, the Atlantis cast and crew did a great job of making us feel at home. It was especially fun doing the briefing room scene and having most of the both casts interact. I really wish that Chris Judge, Jason Momoa and Rachel Luttrell [Ronon Dex and Teyla Emmagan from Atlantis] had been there, but it was nonetheless a treat to sit in a room with the actors we had and listen to David Hewlett [Dr. Rodney McKay] talk. I loved finding out that there’s actually someone on the planet who speaks faster than me and who sometimes trips over his tongue like I do. Seriously, it’s always a pleasure to watch David act and I think he does an incredible job as McKay. VOTE! How would you rate SG-1's "The Pegasus Project?"